Early each Friday morning, dozens of basket-weaving artisans gather at the doors of Uganda Crafts 2000 Ltd., Uganda's most established fair trade craft business. I was lucky enough to spend time working there in 2006 and again in 2008-09. The staff and artisans were my first introduction to life in Uganda, and my time with them has informed much of my academic work. The relationships I've built with the artisans - who do not speak English - are a huge part of my motivation for learning Luganda. When I arrived in Kampala (three weeks ago already! ), I realized that this community of people could easily be a major part of my learning during my time in Uganda. I rearranged my schedule with my teacher so that I could spend Fridays at Uganda Crafts. I gave the idea a trial run last week, and today started in earnest. - First, I know them and they know me. We've been speaking to one another through translators or sign language for years, and so they feel pretty comfortable with me, and I with them. - There are many of them! That means I get to listen to lots of different people speaking, and I get to bounce around having different conversations with different people. There's always something to talk about when you've got 20 conversation partners! - Their English-fluency varies widely. Most don't speak any English, but some speak a very little, and some speak a lot. This means that generally I am forced to do everything in Luganda, but that there is usually someone in the conversation who can help me out a bit when needed. - It's highly motivating to be building my Luganda to strengthen these relationships! In the course of conversation, a number of interesting things have come up. One little thing that I find fascinating is that one of the first questions that the women asked me when I told them that I was studying Luganda was, "Are you learning to write?" When I replied that I am learning to write, the women seemed very impressed - much more than for me simply learning to speak. For women who likely didn't make it all the way through primary school, I can appreciate that the written word probably seems like an extraordinarily high level of mastery. Finally, the support for my studies is really kind of amazing. These women have taken to heart their role as teacher. When one of them overheard me having a conversation with a Uganda Crafts staff member in English, she admonished him. "You should be speaking to her in Luganda only!!" I have invitations to come to houses and practice Luganda with family members. And going through the practice of the FULL set of greetings with every single woman is wonderful practice for me, and they seem to get a kick out of it too. 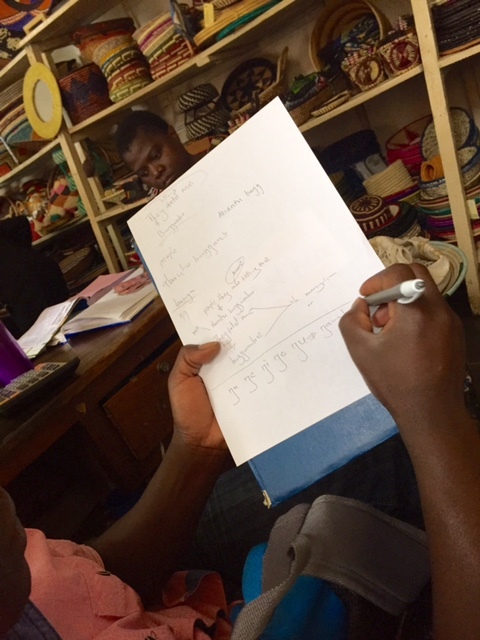 Outside of the artisans themselves, Uganda Crafts staff is also fully committed to taking on the role as teacher. As I kind of expected, both Betty and Lillian, my dear friends/adoptive Ugandan family I've referenced in class, show me pretty much no mercy. They speak to me quickly and then look at me, waiting for a response. Unlike before, I can now understand at least individual words, if not the meaning of what they're saying. But the pressure is on, and they're going to hold me accountable! One of the other staff members, Richard, and I were talking over lunch, and when I said something that was correctly constructed but very incorrectly pronounced, Richard took matters into his own hands. He started drilling me on the phrase, and then the specific sound I was having trouble with (for those interested, it's the velar nasal [ŋ] sound). This led to an hour-long session where we worked on the pronunciation of all sounds - consonants, vowels, and when two consonants are together, and words that use each of those sounds. It was fun watching Richard take on the teaching role. It was also interesting to see his pedagogy - I have a hunch he was reproducing the activities that he did when he was learning English in school. I will have 4 more Fridays at Uganda Crafts before I head back home. So far, it's been a great way of forcing the rubber to hit the road when it comes to my language learning. As always, more to come!